New data suggests that China is moving further away from coal as a primary energy source, a trend experts believe is unlikely to be reversed. New research reveals that China burned 4.7 per cent less coal in 2016 than in the previous year, meaning that annual coal consumption has dropped for the third consecutive year since 2014. The newly released data by the National Bureau of Statistics raises hope that China is on track to reduce its toxic air pollution and continue battling climate change. Previously, China’s coal consumption dropped 2.9 per cent and 3.7 per cent year-on-year in 2014 and 2015, respectively, ending a streak of rapid consecutive growth from 2000 to 2013. 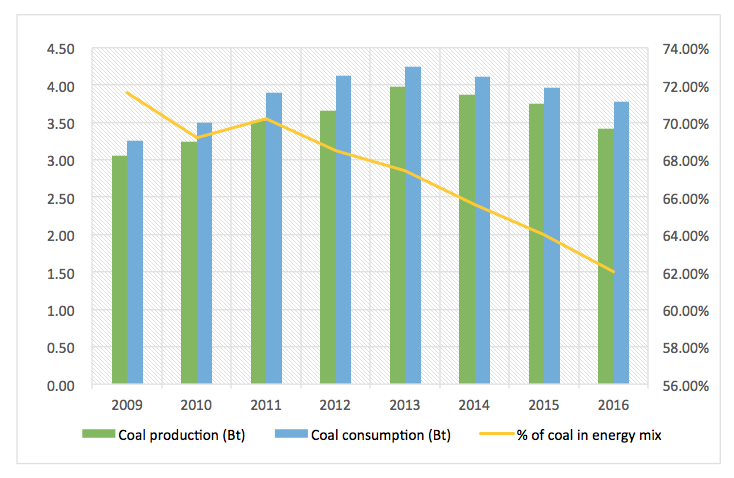 The new data consolidates a view among energy sector observers that China’s coal consumption already past its peak before 2014, much earlier than previous projections that placed it between 2020 and 2040. However, the 4.7 per cent figure is itself disputed. Greenpeace said the drop in the number of physical tonnes of coal burned differs from actual energy units produced from coal burning, which fell by merely 1.3 per cent in 2016. The difference can be attributed to either a major improvement in coal quality or discrepancies in the data. The 1.3 per cent figure echoes a previous calculation by the China Coal Industry Association in January 2017. However, no doubt was cast on the fact that the weight of coal in the energy mix dipped to 62 per cent from 64 per cent in 2015. This means China stands a better chance of achieving its objectives of keeping coal consumption at or below 4.1 billion tonnes, and of keeping the weight of coal in the energy mix at no more than 58 per cent by end of 2020, which are embedded in the country’s 13th Five-Year Plan for energy. Tim Gould, head of the Energy Supply Outlook Division at the International Energy Agency, attributed the trend to shifts in the main drivers of China’s economy, from energy-intensive steel and cement manufacturing to light industry, service sectors and transportation. Transformation in the economic structure has also led to increased energy efficiency. In 2016, China’s economy grew 6.9 per cent while total energy consumption grew only 1.4 per cent, noted Xu Zhaoyuan, a researcher at the Development Research Centre affiliated with China’s State Council. Xu added that China’s economic growth seems to have been significantly less attached to energy consumption since 2013, with average annual GDP growth calculated at 7.2 per cent and energy consumption hovering around 2 per cent. A closer look at the statistics reveals a U-shaped trend occurring last year, as shown by a steady increase in monthly coal consumption towards the end of 2016, said Liu Qiang, secretary general of the Institute of Quantitative and Technical Economics, part of the Chinese Academy of Social Sciences. This is due to a surge in government-led investment into infrastructure construction aimed at reinvigorating the sluggish economy, Liu added. The effect was amplified by private capital rushing in in response to the government initiative, noted Xu Zhaoyuan. This adrenaline shot in infrastructure investment clashed with the government’s ongoing campaign to shed excess coal extraction capacity, which included capping the annual operation time of coal mines. As a result, China increased coal imports by 25 per cent year-on-year in 2016 to fill the gap between coal supply and demand. However, experts told chinadialogue that a fundamental rebound in coal consumption is unlikely. Coal consumption is most likely to remain in slow but steady decline, said Xu Zhaoyuan, considering that a rebound in investment in energy-intensive industries would be unexpected in the current economic climate. This is due to the investment-led economic development model reaching a deadlock, where infrastructure construction is no longer seen as profitable as it once was, noted Liu Qiang. Both experts believe that China’s economy will see even slower growth as the transformation continues, with traditional industry struggling to survive while drivers of sustainable new growth gradually emerge. Many industrial enterprises will find it hard to wean themselves off cheap coal, but China’s diminishing tolerance for pollution makes it impossible for coal to regain significant ground, noted Xu. The Beijing-Tianjin-Hebei region and the Pearl River Delta region, both prioritised as part of the agenda to reduce air pollution treatment , have been told by central government to burn less coal in 2017. The new data bodes well for the climate. A Greenpeace analysis indicates that 2016 could be the fourth year in a row when China sees either zero growth or a decline in CO2 emissions. Lauri Myllyvirta, senior coal campaigner for Greenpeace East Asia, told the Associated Press that China’s levelling carbon emissions have completely revolutionised the prospects for bringing global emissions and climate change under control. Lin Boqiang, dean of the China Institute for Energy Policy Studies at Xiamen University told chinadialogue that “the decrease in China’s coal consumption in 2016 was a result of a change in economic structure and an increase in clean energy.